The 2013 Rose Festival parades and beautiful weather had people from across the region flocking to downtown Portland to enjoy the floats, festivities and fun. TriMet provided more than half a million rides during the Starlight and Grand Floral parade days, TriMet’s two busiest days of the year. Compared to last year, TriMet saw ridership jump both days. MAX and bus ridership for the day of the Grand Floral Parade, June 8, was up more than 19 percent over a regular Saturday. Last year, it was only up by about 5 percent. 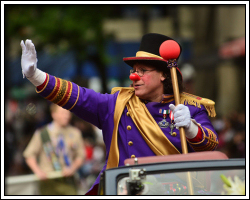 This year’s Starlight Parade day, June 1, saw a big jump in ridership, up 25.6 percent; whereas last year we saw about an 18 percent jump. This was the first Rose Festival since the end of the Free Rail Zone last September, but despite that ridership increased significantly on the MAX over a regular day on both parade days. MAX ridership jumped 35.5 percent while bus trips increased 6 percent for the Grand Floral Parade. A total of 243,400 bus and MAX trips were taken that day. MAX ridership for the Starlight Parade increased dramatically, up more than 40 percent over a typical Saturday, while bus ridership rose14 percent. Overall, 256,800 trips were taken on MAX and buses on June 1. Over the two parade days, 68 TriMet staff performed 130 volunteer shifts as ‘Ask Me’ guides at multiple MAX stations and bus stops before and after the parades to sell day passes, answer questions, direct riders and improve safety on crowded platforms. MAX trains ran on Saturday schedules, with extra trains added before and after the parades. During the Starlight Parade, pre- and post-event, express buses were running between the Lloyd District and downtown. All MAX lines continued to run through downtown during the parades.